This easy roast pork recipe uses a loin joint to produce really tender meat and perfect crackling. 1. Preheat the oven to 180°C, gas mark 4. Heat the oil in a frying pan and fry the onion for 3-4 minutes, add the apple, breadcrumbs and half the sage and cook for 1 minute. Season. 2. Remove the elastic bands from the pork joint and turn skin side down. Make a slit in the centre, nearly to the fat layer then make slits horizontally to the left and right and open up. Fill with the stuffing and re-roll, tie with 2 pieces of string and place in a small roasting tin, skin side up with the stock and blackberries. 3. Bake in the preheated oven for 1 hour 45 minutes. Remove the join and set aside. Blend the flour with the juices in a small saucepan and bring to the boil, add the raspberries and remaining sage and cook for 1-2 minutes, squashing down the fruit. Press through a sieve and season to taste. 4. Remove the crackling and cut the pork into 4 thick slices. 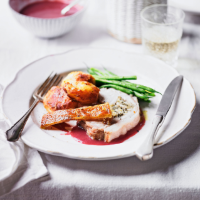 Serve the pork with the crackling, sage and berry sauce, some roast potatoes and your favourite greens. This recipe was first published in June 2014.